Whenever the price of oil diverges from the price of natural gas, opportunities for profit emerge. 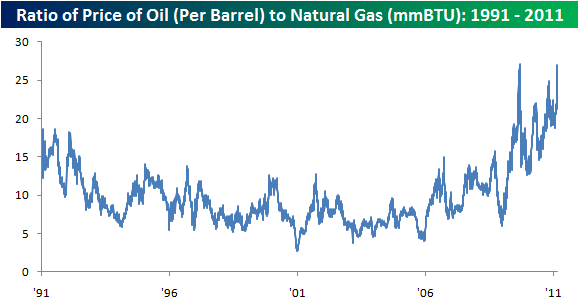 With the price of natural gas remaining below $4 even as NYMEX crude is rising above $100 per barrel, the ratio of the price of oil to natural gas is currently right near record highs. Prior to the last five years, large spikes in this ratio were usually a sign that the price of oil had gotten ahead of itself. However, in recent years the historical relationship has become unhinged due to large discoveries of natural gas reserves in the United States. Given the fact that natural gas is harder to transport, there is less of a market for US supplies outside of the country. The smart approach would be to push gas-to-liquids technologies and liquefied natural gas export terminals. But the Obama regime is instead working on ways to shut down the unconventional gas wealth of the US. How stupid is that? International oil prices are being buffeted by political unrest across MENA (middle east and north africa). This is best viewed as a temporary phenomenon, just one of many possible manifestations of "political peak oil." In other words, it is one type of price bubble. Many opportunists of questionable ethics are using this bubble to drum up business. Sensationalising the situation, they attempt to create a virtual catastrophe in the minds of the public. But more intelligent people can see through the flack to the truth beyond: the oil is still there, the gas is still there, the coal is still there, the uranium is still there, geothermal resources are still there. The only problem of any consequence is the political obstructionism, corruption, and incompetence which impedes the clean, cheap, and abundant use of energy resources. Thanks. And I can certainly assure any readers that my feelings toward them are likewise strictly platonic. If that is any help . . .